Sk:n Clinic – Consultation, Test Patch & Video! So, last Friday (14th May) I had my first consultation and test patch for facial laser hair removal at the sk:n clinic in Southampton. I had previously shared my concerns and nerves about this first meeting… but I needn’t have worried too much. The staff and therapists at the clinic were very friendly and I was put completely at ease in their care. When I arrived, I was given a few forms to fill out… general contact stuff like name, address, next of kin… and I was also given a consent form. I asked if I could have a copy of the consent form and they were happy to oblige. I really recommend you do this and infact, it would be great if they did it as standard. 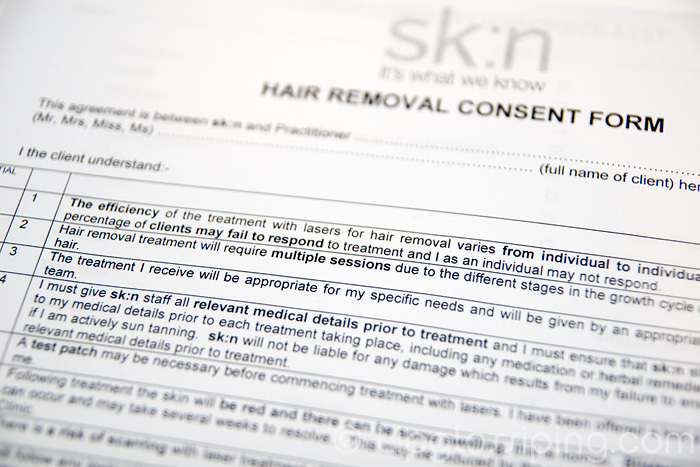 It’s a well written document that summarises many of the important concerns about laser hair removal and if you’re signing your name on the dotted line… it’s good to have a reminder of exactly what you’re giving your consent to right? Hayley went through a checklist of contraindications which included things like asking me if I were pregnant, suntanned (yeah right) and whether I was on any medication including steroids (I was assured that steroid inhalers didn’t count!). We discussed which body areas were going to be treated and at this point I asked if it would be ok for me to pay to have a small patch on my chest included in the treatment area. She grabbed a price list and gave me a quote for 6 sessions (just under £300) which I agreed to. I was asked what I do to currently control the hair growth and I explained that I shave the areas daily. She was pleased with this as it meant that the hair follicles would be intact and undamaged by the plucking or waxing process. If you want to know more about why this would be important and how laser hair removal actually works (along with a video demonstration), check out this page on the sk:n clinic website. The last thing we discussed was after care. At this point, I was offered the option to purchase a ‘starter pack’. What this basically includes is three products that are recommended for you to use after treatment to help soothe and protect your skin. It’s obviously another string to sk:n’s money-making bow to offer you the option to purchase products directly from them at the time of treatment. I don’t think they’re particularly marked up (although the seperate purchase price of £15 for a SPF30 Sunblock seems quite expensive). If you already have these… you don’t HAVE to purchase them. For me, it was a convenient time to pick them up. I’ve already been through a lot of the Aloe Vera gel and I’ll be buying another tube (albeit from Holland & Barratts!). You’re advised not to use your normal skincare for a few days… simply because you don’t want to expose your skin to any lotions and potions that could cause extra sensitivity on an already sensitized area. However, I made sure to check that wearing makeup wasn’t a problem! The single most important aspect of aftercare however, (and Hayley drummed into me!) is sunblock. Do not leave the house unless you’re protected from the sun. 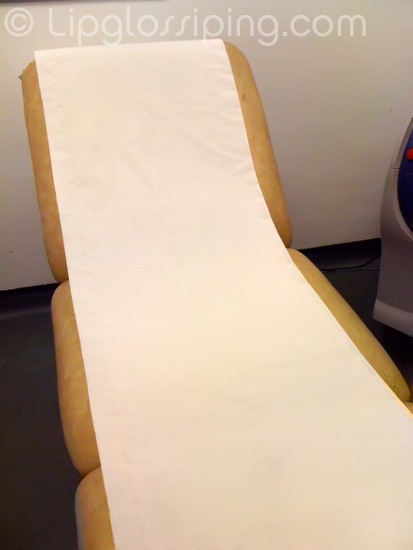 To be blunt… don’t risk a tan whilst you’re undergoing treatment. 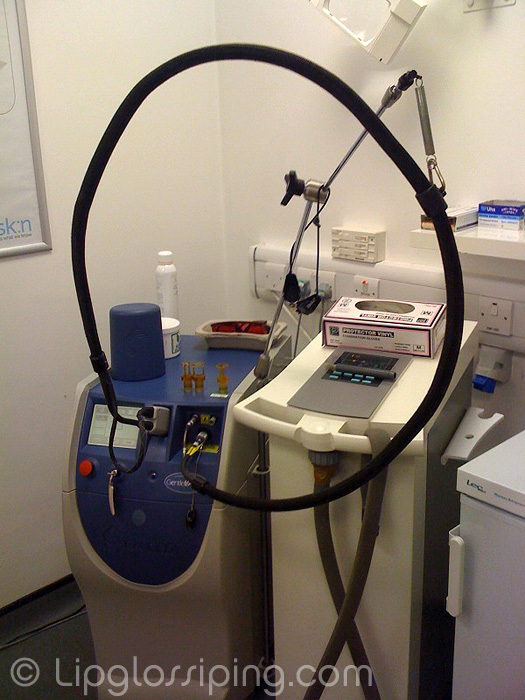 The whole premise of laser hair removal is that it targets melanin, the areas of pigmentation (i.e. dark hair and the follicle under the skin). You start getting tanned bits and you lose the contrast making the treatment less effective and more likely to burn the skin. I was handeed a pair of sunbed goggles… you know, the ones that kinda fit the shape of your eyeballs and don’t extend much further… these are total blackout, so it’s immediately a little more unnerving as you can’t see a thing. A side effect of this is that your hearing becomes a touch more acute… so when the machine (which was right by my head) fired up… I’m not ashamed to admit that my heart beat a little faster. Hayley was constantly talking to me, explaining what she was doing and reassuring me that everything was as it should be. I’m glad she was chatty… it really helped to put me at ease. I’m such a wuss! As the (I’m not sure what to call it!?) laser head bit was put over a small area on my chin… I felt a slight vacuum-y/cooling sensation before the laser fired and I felt a sharp twang on the surface of my skin. It’s not painful… but the anticipation is uncomfortable for me. It’s a bit like waiting for a balloon to be popped. I think that as I get used to it and into the swing of a full session, this feeling will fade… but I was really aware of anticipating the next laser fire. What I wasn’t expecting however, was the smell. Burnt hair… really quite unpleasant and thanks to the treatment being carried out around my chin and top lip, right under my nose! I think I’ll breathe through my mouth next time! Immediately after, Hayley sprayed my skin with thermal water and applied copious amounts of Aloe Vera Gel which I forgot to rub in and spent the next ten minutes looking like I’d sneezed on myself. My skin immediately turned a shade of lobster pink and I was sent on my merry way with an appointment for my first full session (Tues 18th May) and my starter pack of after-care products. You can see how my skin looked 12 hours later and read my concerns at the time by reading my update here. 2. …the treated area may become red and swollen and may remain so for several days after treatment. Sorted. My skin probably isn’t going to fall off then. I am Norman normal, just perhaps a teeny bit more sensitive than hardier types! You’re gonna have to excuse the hair… I have shaved twice since my test patch on Friday… I guess you can see why I so desperately want this treatment done huh? 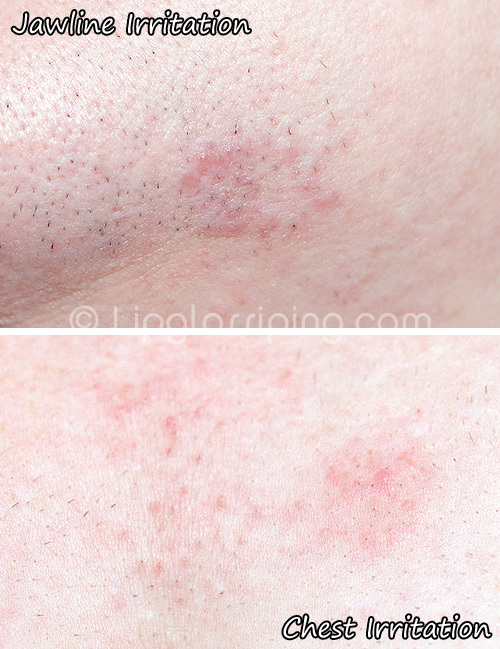 Anyway, at the risk of stating the bleedin’ obvious… the red bits are irritation and these photos show the affected areas 60hrs after treatment. Honestly, I’m kinda dreading what I’m going to look like on Wednesday morning after my first full session. I’m thinking Freddy Krueger. Don’t forget I’m practically having the whole of my lower face lasered… I’m not sure I’ll be able to leave the house for a few days if the test patch was anything to go by. I guess it’s something I didn’t consider. Oh well, I think it’s time to stop worrying and wait and see what greets me in the mirror on Wednesday morning. So that’s it really… a full on update. In total, I’ll be having six sessions and although I won’t be updating with as much detail as this after my subsequent treatments, I’ll still be doing progress reports and posting photos when appropriate. I guess that if I’ve got something worth sharing, I’ll be letting you guys know about it. Here’s a vid that Mr. L shot when we went for a cup of tea afterwards, please excuse the sillyness at the end. Apparently, I’m boring, unlike the dude that walks behind me with a giant red erection… no, really (40 seconds in). sk:n consultation and test patch from lipglossiping on Vimeo. Good luck tomorrow, take plenty of painkillers! yay, thank you for the lovely fully detailed update: i loved reading it and as you know, I love details. Blimey those photos of the room with the “like a big photocopier with a hoover attachment” and the chair itself look a bit scary. I love it though you didn’t put a nice sepia arty farty ‘filter’ (or whatever the name is) and left quite natural looking: it’s the reality of the treatment. Ouch, the elastic band feeling is not something I would feel comfortable with, ouch ouch ouch. £300 for 6 sessions: sound like a right bargain to me. Sounds tempting, the ladies sound all so lovely. Umm, tempted to pick up the phone and enquire how much it would be to ‘finish’ up my legs. Thank you ever so much for sharing this. p.s I love your cheekbones. I think what you’re doing, blogging about your experience is amazing. And you’re blogs are always hilarious. That was a big erection! I had laser surgery on my upper lip because threading broke me out in a rash and I didn’t want to wax. I had to sign the exact same thingy as you and lie down with these massive glasses on, the lady who did my treatment was brilliant. She thought I was always crying because that laser “snap” made my eyes water like mad. Because I’m Indian (darker skinned) she said that aftercare was most important as otherwise I would have scars. I was always given a bag with water, ice and gauze in it to apply on the way home. Once I got home I used to wash my face with cold water for about half an hour or until my face stopped feeling hot. Apparently you’re never ever to put ice directly on the skin because it can cause more damage. When my skin was cooler I’d put a thin layer of aloe vera gel on my upper lip and just relax for a bit so that I had no urge to itch or got no horrible scars because I think the darker the hair, the more heat they need to use or something? When I had mine done, the lady put some clear gel over the area and then zapped it and you’re right about the smell..it was not pleasant but the pain wasn’t as bad because she put some gauze infront of my teeth (under my upper lip) so it wouldn’t hurt as much. It’s really worth it in the long run though, I mean it clears about 90% of the hair which is brilliant.